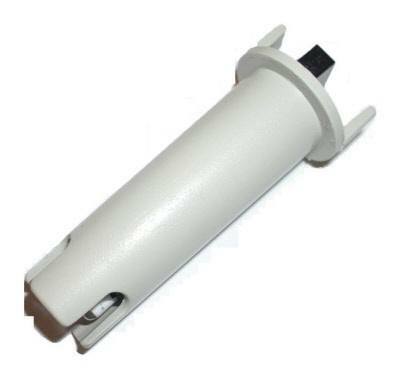 The Milwaukee replaceable electrode is a multi-parameter electrode for use in water testing applications. Three models are available to fit compatible Milwaukee portable meters (sold separately). The Mi57p measures oxidation reduction potential (ORP) and temperature and fits the Milwaukee ORP57 meter. The Mi58p measures pH, ORP, and temperature and fits the Milwaukee pH58 meter. The Mi56p measures pH and temperature and fits Milwaukee pH55 and pH56 meters. The electrode slides into a fitting that screws into the meter body for secure installation.